There’s a reason why first-time home buyers are purchasing condos as their starter homes rather than single family homes. Condos perfectly accommodate the busy lifestyles of young professionals, whether they’re living on their own or with a partner. Condos greatly decrease the burden of home maintenance, making first-time home owning much less stressful. With the condo association taking care of all exterior maintenance, mowing the lawn, snow removal or a leaky roof will never be something you have to worry about. Condo living relieves some interior home maintenance stresses as well, as furnace and window maintenance are taken care of by property management. Purchasing a pre-construction condo, at Valhalla Town Square allows you to personalize your home to perfectly suit your needs and style. With the option of selecting new and modern finishes for flooring, tiles and cabinets you can be sure your suite will show off your preferred taste. Owning a brand-new suite also offers the luxury of brand-new appliances. As a first-time home buyer there are many costs that can easily add up, however a cost that will weigh much less heavily on you when buying a condo, is purchasing furniture. Condos require much less furnishings than houses as there are no second stories or basements to worry about. This is a large savings factor, as many first-time home buyers don’t have very much, if any furniture. Ideal for young home owners, condos offer a wide variety of amenities that can be enjoyed by residents, without the worry of maintaining them. 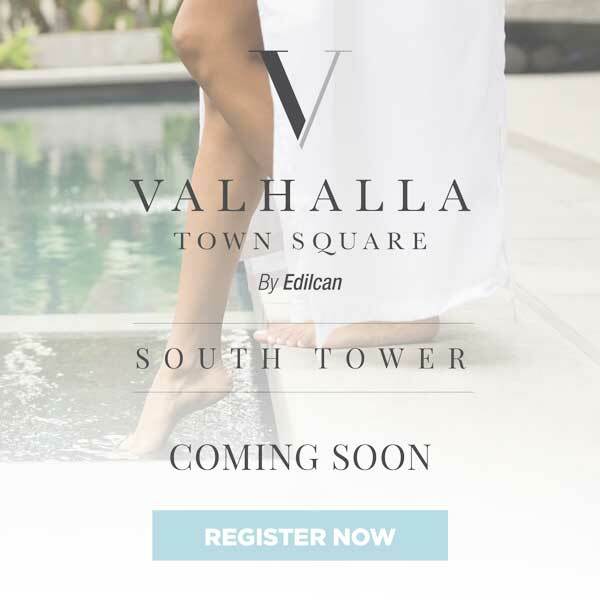 Valhalla Town Square features a gym, social lounge, yoga studio and swimming pool that suite owners are able to use at their own discretion, all year long. Another notable factor that entices first-time buyers to purchase condos, is often their proximity to downtown, as well as other fun and upcoming neighbourhoods. Living within walking distance of shops, restaurants and other amenities allows residents to lead a more social lifestyle, as well as save on transit costs. Learn more about Valhalla Town Square amenities by following us on Facebook, Instagram and Twitter.